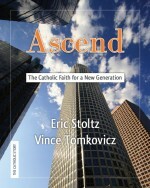 It’s been a long road, and our book Ascend: The Catholic Faith for a New Generation is in the final stages. Writing the book was the easy part: Vince and I have been very busy with the thousand details of producing such an innovative work. Getting this site up to provide information about the book over this past week is only one example of one such detail. And it often seems that each detail has a long to-do list associated with it! As we lead up to the November publication, we ‘ll be offering thoughts and news here, some associated with the book and some more general reflections. Despite the many things that still need to be done, or perhaps because of them, we know that date will come before we know it. Just last week, for example, the book got a page at Amazon! You can pre-order it there at a discount. So stick with us, and come back here for updates. We hope and pray that Ascend will reach many people and help them to grow in their faith life. This entry was posted by Deacon Eric on Monday, June 8th, 2009 at 8:39 am	and is filed under Ascend. You can follow any responses to this entry through the RSS 2.0 feed. You can leave a response, or trackback from your own site.